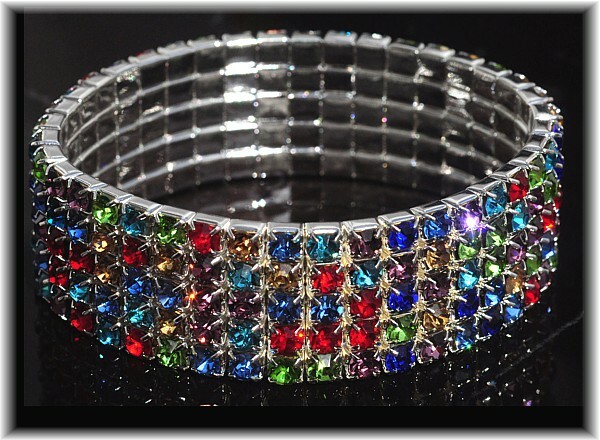 The Rainbow Five is a slightly smaller version of the Rainbow Band, but it's crystals are darker in colour. Red, royal blue, turquoise, amethyst, topaz and jet are the colours in these shimmering five rows that can be worn one on top of the other for depth, one on either wrist for the latest gauntlette style, or just on their own for a sparkling wristband that can be worn to match or contrast your outfit. Silver finish with Austrian crystals. Width 17mm.